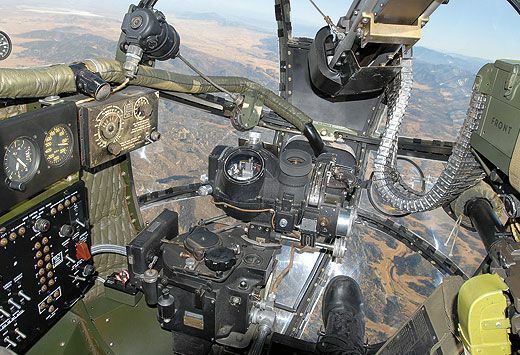 Pilot Jim Terry, a retired U.S. Air Force major encased in fire-resistant green Nomex from fingertips to ankles, disappeared through Pacific Prowler’s forward crew hatch. I scrambled in after him. 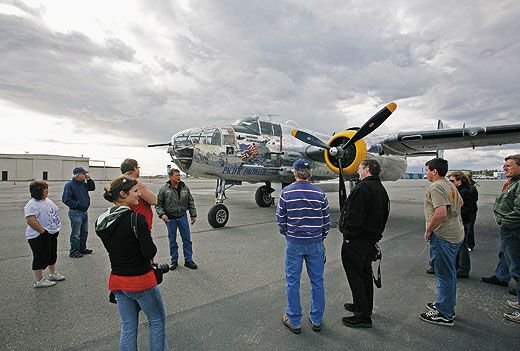 “Don’t touch anything painted red,” said Terry from the cockpit of the restored North American B-25, which had flown into Alliance Airport in Fort Worth, Texas, for a weekend airshow last October. “Use only the yellow handles.” He pointed to the seat that would be mine on the flight, during which we would shoot air-to-air photographs of two other vintage aircraft. My seat was mounted high against the upper bomb bay, and it wasn’t easy getting to it in the dark and using only the yellow handles. 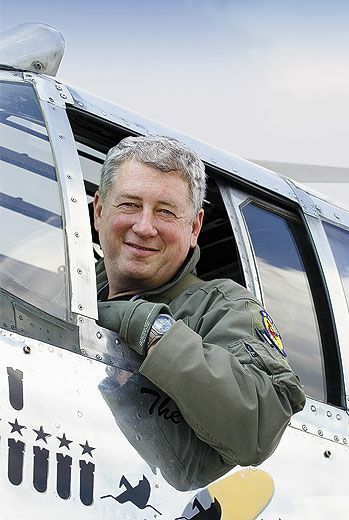 Terry was already buckled up when I started strapping in, my feet dangling two feet above what passes for the floor in a World War II bomber. Co-pilot Scott Perdue, also wearing a green jumpsuit, climbed through the hatch and issued the same instruction to the guy behind him, a plump Dutch photographer who popped through breathless and confused by the rapid-fire lecture on primary colors. I tapped the yellow handles in sequence for him. He sat down and struggled to untangle the webbed seatbelt, so I leaned over and unhooked his metal footrest (touching its forbidden red fastener—but for the cause! ), then my footrest, then loosened and fastened his seatbelt around his waist. Up front, Perdue threw a leg across the engine controls and slid into his seat, and Terry’s girlfriend, Kandi Thomas, lifted herself in and closed the hatch, sealing in Pacific Prowler’s special fragrance: 67 years’ worth of engine exhaust clinging to the original olive-green insulation, with subtle undertones of wiring, worn upholstery, and oil-soaked dirt. The only light inside the sweltering B-25 fuselage streamed through the cockpit’s deceptively small windshield, the tiny observation porthole above my head, and the thin crawl space between the bomber’s ceiling and the bomb bay’s roof. In the rear of Pacific Prowler, seven friends of Terry’s crowded in where waist and tail gunners once crouched, excitedly strapping in for takeoff. Within two minutes of boarding, Terry fired up the left Curtiss-Wright smoke-spewing radial, which shook the elderly aluminum structure and howled loud enough to numb my eardrums. The right propeller revolved and the engine caught, doubling the noise and vibration. Sweating streams, I watched oily smoke swirl throughout the fuselage. Turning down the runway’s business end, Terry and Perdue breezed through the instrument check, then slowly shoved the throttles to redline and stepped off the brakes. We bounded down the runway toward the afternoon sun, the first time light touched my face. The pilots held the bomber’s nose high while it chewed up what felt like too much runway. Around the time I started thinking that if the pilots were wearing Nomex, maybe I should be too, Pacific Prowler parted with the ground. During the climbout, I got up and moved about the cabin. I lifted the metal step with a foot and hooked it back against the wall, let myself slide down the seat, and landed with my feet planted on each side of the hatch. Then I fell to my knees and crawled toward a narrow tunnel that runs under the cockpit and leads to the nose turret. The tunnel was filled with a blinding, ethereal light. Pacific Prowler is based at the Vintage Flying Museum at Meacham International Airport in Fort Worth, where Jim Terry leases hangar space for the bomber and a Douglas C-47. Both aircraft are part of a 501(c)(3) organization that he runs salary-free. As a nonprofit, the organization is forbidden from charging passengers, though it is allowed to offer “free” rides in exchange for “donations.” Donations for the organization’s “history flights” run $400; each flight lasts an hour, with 35 minutes devoted to a safety briefing, firing up the engines, and taxiing to the runway, and 25 minutes of actual flying time. Any funds generated by Pacific Prowler and the C-47 are pumped back into maintaining the vintage aircraft. The number of flights has dropped from an average of 32 a year to 26 in 2009. Terry blames the recession; the company’s customer base—World War II veterans—is also dwindling rapidly. “Taking four passengers for a flight is break-even,” says Terry. To compensate for lost revenue, they’re flying more second-in-command training: For a $5,000 donation, they teach the fine points of copiloting, and the student gets to fly from the right seat for two hours. The photo missions too, which can carry two photographers at a time, fetch $2,500 an hour. The United States is blanketed with similar organizations, which, like Terry’s foundation, fly passengers in all types of World War II aircraft: Boeing B-17s, Consolidated B-24s, North American P-51s and T-6s, and yes, plenty of B-25s. 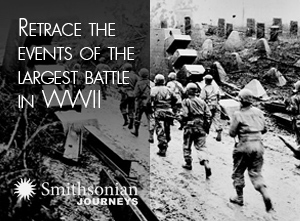 Nearly 10,000 of the twin-engine medium bombers were built, and they flew in every theater of World War II. 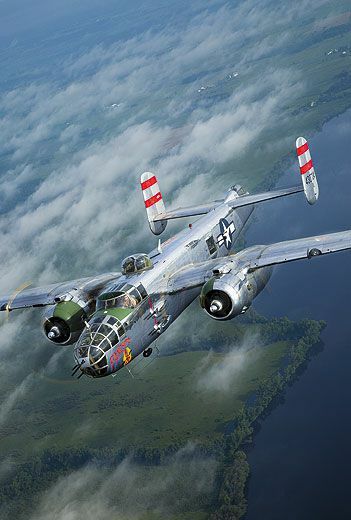 The military retired its last B-25 in 1960. After the war, the bombers found work as civilian transports and firefighting aircraft. In fact, B-25s are so ubiquitous that Pacific Prowler wasn’t the only one at the Alliance airshow. Barbie III, parked outside the ropes, is owned and operated by History Flight, a Marathon, Florida-based organization. At the airshow, American Airlines paid History Flight to fly passengers for American’s Sky Ball: If the airline hadn’t done so, History Flight could not have afforded to make the journey from Florida to Texas—the decrease in the number of passengers would have made it impossible to cover operating costs. “People don’t have the disposable income these days,” says John Makinson, History Flight’s chief pilot and flight instructor. The competition, the 800-pound, alpha-male, silverback gorilla on the tarmac, is the Commemorative Air Force, with more than 150 warbirds in 72 units across the country. “We visit 100 airshows annually,” says Autumn Hicks, the CAF’s director of public relations. 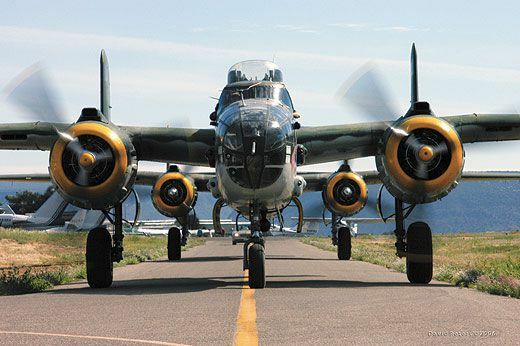 “And you can get a ride in quite a few of them,” including three B-25s (Yellow Rose, Maid in the Shade, and Miss Mitchell). “The CAF has all kinds of vintage airplanes, and they can put together an entire airshow package,” says Terry. “Since it’s all volunteers, they can do it pretty cheap.” Even so, “the recession has done a lot of damage to what we’re trying to accomplish,” says Hicks. The day before my flight in Pacific Prowler, Scott Perdue took me on a quick tour of the bomber. After a while, he abandoned me beneath the shade of the B-25’s wing. As I sat there, a 30ish man carrying a kid walked across the nearly vacant apron toward the Prowler. I convinced myself that I wouldn’t show off or even get involved. He warily touched the barrel of the machine gun mounted in the nose, then moved in to inspect the left prop. The kid squirmed, and when the man let him down, he shot under the bomber and into the open bomb bay doors. The man rushed after him. And I followed them both. “Check out the autographs,” I said. The man, stunned, took a quick glance at all the signatures in black Sharpie. “Who were they?” asked the man. “You know the Doolittle Raiders, right?” I said to an elderly couple, who were overjoyed by the sight of Pacific Prowler. Of course they did: He was a World War II vet, and she worked in an aircraft factory during the war. A younger guy asked how the crew got on board, so I motioned for him to follow me under the belly to the forward hatch, and showed him the entrance. By the time Perdue returned, I’d told people that the Prowler had survived the war because it was a late model (a B-25J) and a trainer (those two seats aft were where the students sat between lessons), and because it never flew overseas. I also mentioned that Tallmantz Aviation bought it in 1962, and modified it into a camera platform to film scenes for movies such as Catch-22 ; that it served as a VIP transport for the U.S. Air Force until 1958; and that it had been junked in San Antonio, Texas, where Terry found it in 2002 and rebuilt it with volunteer labor. 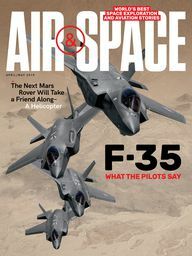 In short, I regurgitated everything from the Pacific Prowler Web site, my former days as a model-building warbird geek, and from talking with Perdue. Near the end of the flight, I crawled inside the greenhouse-like nose turret a second time. I swung the Browning .50-caliber machine gun from side to side and up and down, assured that it could spray a 180-degree arc of lead if we were bounced by enemy fighters attacking central Texas. Once I tired of playing war, I thought of how exhausting it would be to be cramped inside, trying to remain alert for hours on end, how steely-nerved a bombardier needed to be to peer into a Norden bombsight while Nazi gunners sprayed the airplane with a burst of flak, and how relaxing it was to forget all that and look through the plexiglass while Texas slipped past 1,000 feet below. The Dutch photographer squeezed into the nose turret with me and fired off a few shots—with his cameras. After we returned to our seats, Terry and Perdue set up to land directly into what remained of the sun. I strapped in just as the speed decreased and we began dropping slowly. They gently worked the B-25 to the ground, and as the main gear touched down, the nose leaned over and the front gear settled in. With darkness closing in, we turned off the runway and followed a golf cart back to our spot on the ramp, where the pilots set the brakes and shut down the engines. After the props finished spinning, Thomas smiled and handed back the headset and said something that sounded like a warbling adult from a Peanuts cartoon. I stuffed the headset between insulation and a stringer, and she opened the crew hatch and crawled out, followed by the Dutch photographer. It seemed like he couldn’t get out fast enough. Not me. 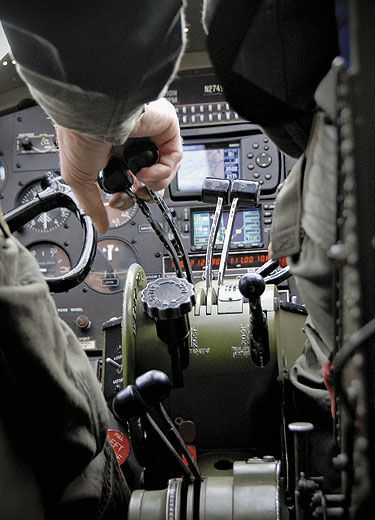 I tried to memorize the location of the switches, wires, and instruments, and the texture of the handholds, footrests, and upholstery, clinging to my final moments inside a B-25. Finished with the last checklist, Terry turned and pulled off his gloves. We made eye contact. He smiled faintly, and his lips moved. I shook my head and yelled “Huh?” His lips moved again. Still deaf, I took a stab at it. “What a [expletive] ride!” I screamed. Freelance writer Phil Scott’s latest project is developing his Web site: gratescott.us.